Includes everything required to present and perform Hi Brow professional brow treatment. 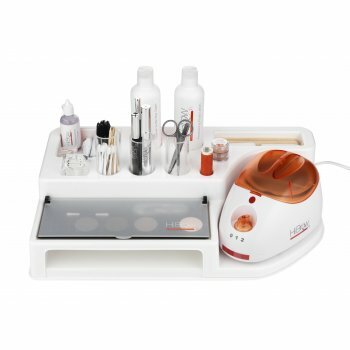 Designed to achieve beautifully stylised brows by enhancing the whole eye area and presented in a professional, easy to use trolley top unit. This kit is ideal for students who have completed or are working towards completing our Highly Defined Brows course. Eyebrow growth & conditioning serum, Silky thread, Mirror, Consultation cards, Wax Heater, Soft facial wax, Rose cleanser & after wax cream, Freshening rose lotion, Camouflage concealer, Brow measuring stix, Brow shaping charts, Orange wood sticks (pack of 50), Brow waxing strips, Deluxe Professional scissors, Deluxe Professional tweezers (pack of 2), Professional brow tints (dark charcoal, dark brown, light brown & soft dove grey), professional palette, spatulas (pack 50), sponge applicators (pack of 50), disposable mascara brushes (pack of 50), glass mixing dish, brow pen, professional wax pencil sharpener, salon leaflets & salon poster (pack of 2).